The Yolo Big Mouth is a 12’ Stand Up Paddleboard that is a great all-rounder for anything from yoga to expeditions. However, it is the extreme stability and load capacity that makes it a very enticing board for anglers as well. Because the board is very easy to paddle, it is also a good choice for beginners who are not used to angling from a stand up paddle board. The stability of the Yolo Big Mouth is easily it’s best feature, but it is also quite spacious as well. This means that you can strap down a large cooler to the board and use it for a seat if you get tired of standing. The Big Mouth is 35” wide and has a weight of 37 lbs, but features a rider limit of 320 lbs, which is quite good. Apart from the integrated cooler tie downs, the board also has a double bungee system, so you have more than enough space to bring along plenty of gear. Anglers who enjoy documenting their catches will also appreciate the built-in GoPro mount that can be found at the front of the Big Mouth. In terms of design, the Yolo Big Mouth is quite a stylish looking board. 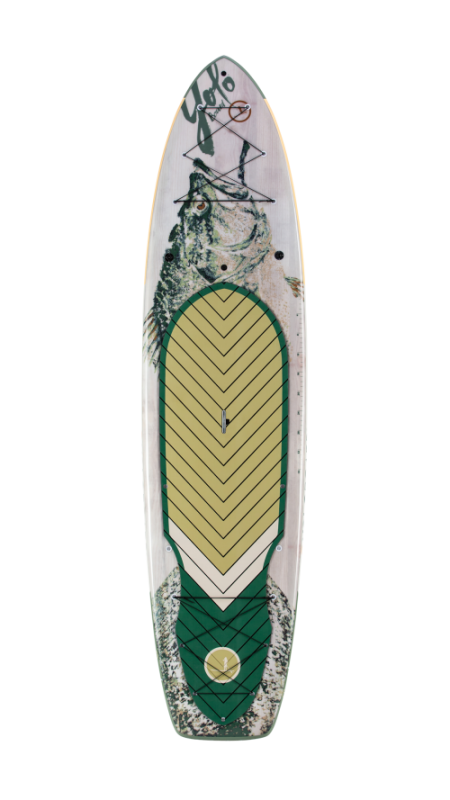 The custom graphics on the board is particularly eye-catching. It’s not just designed to look good either as the V-shaped hull actually helps with keeping the ride stable and quiet. This means that you can glide through the water silently without scaring off the fish. As it has a durable hammerstrenght epoxy construction, the Big Mouth is able to handle plenty of wear and tear. To make the board easier to carry, it has a LiftSUP pop-out handle that takes care of this task. The Yolo Big Mouth stand up paddle board is sold as a package that includes a comfortable traction pad along with a center fin. If you are going to use your SUP board primarily for angling, but also want something that is versatile enough for other recreational use, then you can’t go wrong with the Yolo Big Mouth.